Sindhi cuisine has many exotic recipes.Most people although, think of Papad and Kadhi. 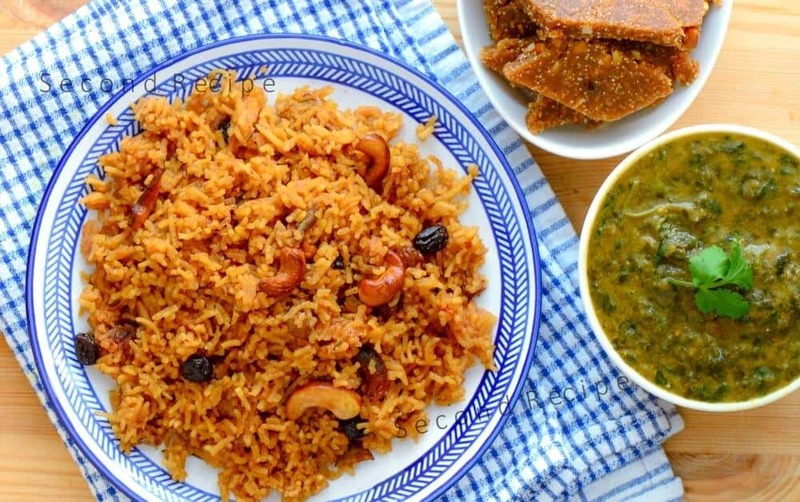 Sindhi Tairi-Sweet jaggery rice is one such exotic recipe. There are many gluten-free vegan dishes also which have evolved over time. The food is not overly spicy, yet has very distinct flavor. Tairi is a sweet pilaf using jaggery. We usually serve it with Saibhaji and fried potato chips . Usually, we eat this on Sankranti & Teejri festival.We also serve this during weddings and weekend brunches. Sindhi community is probably one of the biggest close knit ones.They also love adventure.They are foodies,travelers and also entrepreneurs.Hence, cuisine is a mixed bag too.You will find lot of exotic items like pasta in curry.Probably evolved as a curry after loads of immigration and travel stories.Not many people new macaroni when we were growing up in India.We have a rich cuisine.Use a lot of dry fruits,milk,mawa while cooking.They love to throw dinners,parties and have a huge circle of friends unlike what may be portrayed in Bollywood. Add the cashews,fry them until golden brown and keep it aside. Mix all the ingredients, add 3 1/4 cups of water . Add cashews,saffron.Cook until all water is evaporated or rice is cooked. Click Sindhi Recipes for additional Sindhi recipes. Finally click video for more recipe videos.